Good morning everyone...hope all is well with you and yours today!!! We have been staying inside much of the time the last few days because of the 100+ degree weather...it even got up to 106 one day...yikes!!! Have you been watching the Pillars of the Earth mini series??? We don't get the channel it's on but borrowed some copies....I read the book series by Ken Follett and it's wonderful!!! Anyway....on to the Moxie Fab World Tuesday Trigger...don't ya just love the colors on this beautiful box!!! 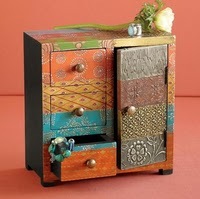 I found my inspiration from the colors and the drawers....I used papers from Stampin Up! and Basic Grey's Marrakeck for the blocks in the background and the wood bird cage and bird from Kaisercraft. The brads and ribbon finish it off. I used the Sketch Challenge on Splitcoast to create a card for our Queen for the Day challenge......none other than the wonderful and ooooh sooo famous Cindy (Mothermark)!!! I can't think of anyone more deserving of this honor...she has the biggest heart of any stamper I know and is a sweetheart to boot!! Don't tell her I said that cause she tends to get a case of the big head so mum is the word!! Now, I gotta tell ya, her gallery is like no other....check it out here. 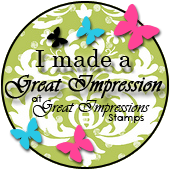 She is a one of a kind artist and there is noooo way this humble stamper could ever case one of her masterpieces and do it justice so I used lots of polka dots (Cindy's trademark) and a teapot to represent her two years of teapot challenges. 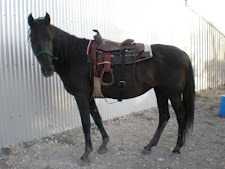 I know, I know...I took the easy way out but since I am old and feeble, I can get away with it...LOL!!! The teapot from Papertrey Ink's Tea For Two set was stamped with Pretty in Pink and rock n rolled with Regal Rose. It was then run through the cuttlebug with the Dotted Swiss folder. Another teapot image was stamped with Pretty in Pink, rock n rolled, cutout, and popped up over the other image with dimensionals. Lace, ribbon, button, and silver cording finish it off. Thanks for visiting today....since I have been playing all morning, I better get busy on this messy house and visit some of my favorite blogs....have a wonderful day and stay cool!!!! Joan oh WOOOWEE you sure did rock these colors in the inspiration....So beautiful that box is sooo sweet and your card is even sweeeter!! LOVIN the colors on your teapot card too!! Fabulous cards sweetie! Wow Joan!! These are so awesome!! 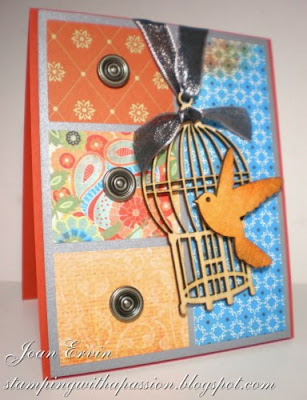 I so love your inspired creation with all the colors and the bird and birdcage. Perfect!! The teapot looks so elegant. So soft and beautiful! Both of these are great and I especially like your take on the moxie fab world trigger, wonderfully done. Thanks for stopping by to visit me today :). Isn't it great that we have so many opportunities as nurses, and every one seems to find their special place! Wow, Joan! Awesome cards. The card honoring Cindy is spectacular.... 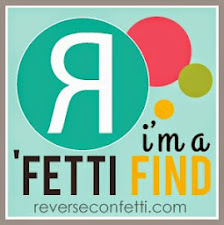 I wish I created this.... even if I am older & more feeble than you are! The 'birdcage card' is pure genius! Love them both. What a great card - love all the colors and the bird is perfect! Gorgeous cards, Joan! You totally nailed the Moxie inspiration! And, the PTI is just stunning! Beautifully done! Love the card you made for Cindy but the one above is gorgeous. Love the drawer look to it. Beautiful job on both. Where do I start Joan with these beautiful cards!! Love your take on the Moxie inspiration! The bird cage and bird are stunning. 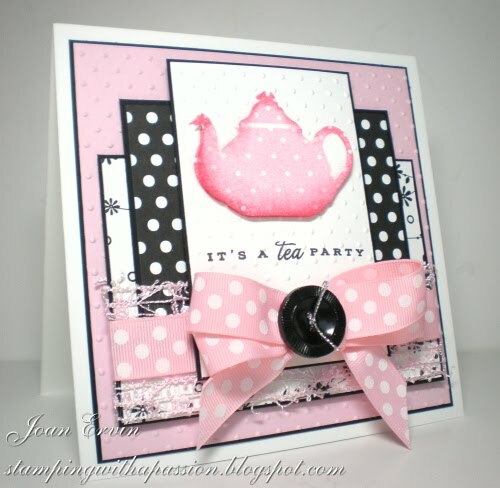 And your teapot card, well, it's simply stunning!!! So girly too! Lovin' your ribbon and lace. Totally fabulous! Stay cool!!! Love your Moxie Fab inspired card! The brads and the paper together are just awesome! Wow!! 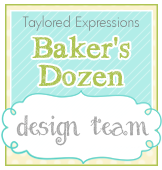 Love your card -- your inspiration is perfect with the card! Wow Joan you really rocked these challenges. I love your take on the Tuesday Trigger, gorgeous! Oh my gosh girl! Both cards are AMAZING! Your inspiration card turned out beautifully! Love that bird! Your SCS card is GORGEOUS too! LOVE all that pink!! Ohhhhh, beautiful work! 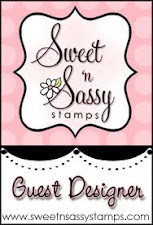 I'm especially lovin' that pink card...totally SWEETNESS!! I just love your trigger card Joan! and your pink tea card is so pretty! Beautiful cards! I love how you recreated the "drawers." Great idea. And congrats on being a Trigger Target! Your card is perfect for the trigger! LOVE it!! Great take on the IC piece, the birdcage is so cool. Just had to say that your pink teapot is gorgeous! Black and pretty in pink - love this combination!